You are here: Home / Wondering what happened to the Orlando Tributes at Legacy of Hope? A local non-profit wants to make sure future generations of Texans will not forget the overwhelming support Orlando shooting victims received at an iconic Dallas LGBT symbol. More than a week after the terror attack in Orlando, 18 people remain in the hospital and four of them in critical condition. 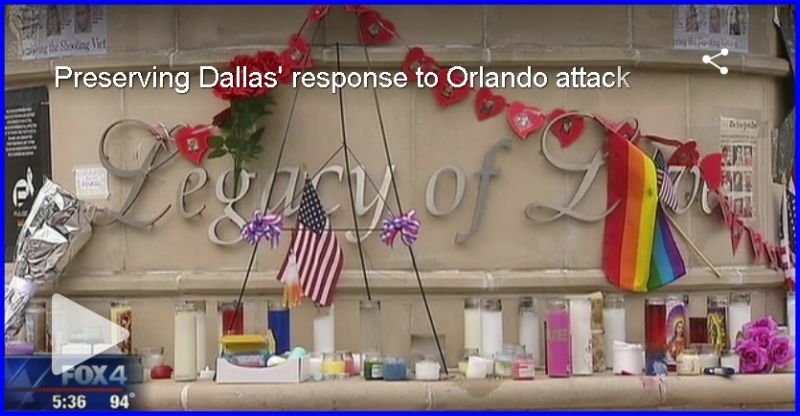 However, the outpouring love and support for the victims continues in North Texas. Even though the shooting took place over a thousand miles away, it’s had a major impact on the LGBT community nationwide. Kevin Whitt has been to the Legacy of Love monument in Oak Lawn every day since the Orlando massacre stunned the nation. Read the full story and see the video on Fox4News.com here.